Several comments have shown us that many of you are very interested in our therapy method and in its mechanism of action. Consequently, we would like to explain the medical details to you in today's update. Our visual system consists not only of the eyes, but also of the optic nerve and the visual cortex, which is located in the rear area of the human brain. Signals that reach the eyes are transmitted from the retina to the optic nerve and on to the visual cortex, where visual perception – or vision – finally takes place. Damage occurring within this complex system may result in visual field loss. Visual field loss may take several forms, some of them even leading to complete blindness in patients. Such visual impairments may have various reasons. In the case of glaucoma, for instance, high pressure within the eye usually causes gradual neuronal death within the retina and the optic nerve, which in turn causes signal transmission to the visual cortex to be impaired. The result is visual field loss, which patients often perceive as tunnel vision. 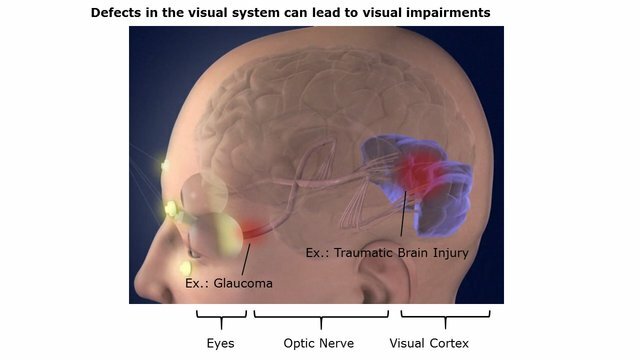 Other causes of visual impairments can be traumatic brain injuries or strokes. If damage occurs, for example, within the visual cortex, the brain is no longer able to correctly process all visual signals it receives. Thus, in such cases, patients often suffer from visual field impairments even though their eyes and optic nerve are intact. In other words, the causes of visual impairments could not be more diverse, yet they have one thing in common: They are all due to neurological damage within the visual system. This is precisely where the EBS therapy method comes into play: The method's stimulation signals, which are perfectly tailored to each patient's individual needs, may alleviate visual impairments whose causes are located behind the eyes (neurological causes). Did you know that EBS is short for Electrical Brain Synchronization? These three terms summarize our therapy method's mechanism of action very well. Indeed, using electrical impulses, we can stimulate neurons in the visual system and in the brain. As a result of electrical stimulation, neurons may synchronize. To explain this phenomenon in more detail, we believe traumatic brain injuries (which, for instance, occur after accidents) can be a helpful example. Because of injuries, for instance in the visual cortex of the brain, a large number of neurons may die and be lost forever. In many of such cases, a number of neurons survive and remain fully functional, yet they lose their communication partners – the neighboring neurons. Consequently, these surviving neurons are also called silent neurons. If silent neurons are stimulated by means of low alternating currents, they are excited and start transmitting signals themselves again. Thus, the result may be new connections with other neurons or even with other intact brain areas – a process that is called neuro-synchronization. But this is not the only thing the EBS therapy method can do. In addition to the reintegration of silent neurons into a functioning network, there is a second aspect that improves the efficacy of our therapy method: It prevents that additional neurons die. Glaucoma is a particularly helpful example of this aspect. This is due to the fact that glaucoma not only causes neurons to die, but also causes them to die slowly and continuously, i.e., that it is a degenerative illness. In glaucoma patients, alternating current therapy may stimulate the metabolism of dying neurons and thus stabilize these cells. As a result, the neurons are enabled to transmit signals again. In medical contexts, this process is called neuroprotection. Both of the above mechanisms of action thus enable therapy centers to help many patients suffering from visual field loss. Even small improvements may alleviate the visual impairments of such patients. "Immediately after treatment, I felt that something had changed. Back in Australia, my doctor confirmed this feeling. Both in terms of visual acuity and in terms of my visual field, tests showed clear improvements. In practical terms, this means that I can see my piano keys more clearly again and read the buttons on my computer keyboard without moving my head back and forth. Also, I no longer have to feel the edge of a glass when filling it, and watching TV finally makes sense again. I am really glad that I had the opportunity to undergo this new kind of treatment." This success is made possible primarily by the precise adaptation of stimulation parameters to the patient, which is done by using a unique and patented combination of EEG and electrical stimulation. We hope that this update has provided you with some new insights into the fascinating world of the EBS therapy method, and we are looking forward to your questions and comments.